Stuff Points: Earn 50 points when you buy this stuff. Our Deluxe Kit is for anyone who knows they love the cleaner. Get 1 32oz. Super Shot liquid concentrate, 1 64oz. liquid concentrate refill, 1 30oz. tub of paste and 2 scrub sponges. Everything you need to clean your home, office or vehicle without chemicals for over a year. Replace all of your household cleaners with this one, environmentally friendly super cleaner. 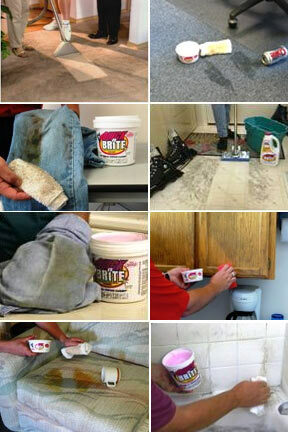 Quick 'n Brite was first formulated over 50 years ago, and was developed to tackle all of your cleaning needs. It is a biodegradable cleaner that is environmentally safe, yet strong enough for the worst stains and messes. It is not only the best household cleaner, but it is used extensively as an industrial and commercial cleaner as well. It is one of the strongest, safest, and most widely used cleaning products around. The need to stock dozens of specialty cleaners is eliminated because Quick 'n Brite is all you need. This kit will take the place of dozens of cleaners that you use everyday. From window cleaner to stain pre-treaters, it literally has hundreds of uses. It is safe to be used around food, children and pets, and it won't harm the environment, no matter how much you use. The Deluxe Kit comes with both the paste and liquid concentrate versions of the cleaner. Both versions work the same way, but the liquid can be more convenient for certain types of jobs. It is great for mixing with water, and is best used for steam cleaning machines or for mixing and diluting into a spray bottle. The paste is better used for set in stains or jobs that require more attention. To make full strength liquid from the paste, you will need to melt the paste in the microwave or stovetop without adding water. Quick 'n Brite contains no toxic chemicals, cleaning solvents, or harmful abrasives. It is an enzyme cleaner, and gets its tremendous cleaning power from a natural surfactant making it totally biodegradable and environmentally safe. It has been tested by an independent lab, which concluded that the product was biodegradable and non-toxic. This means that it is entirely safe and requires no special handling like so many other household cleaners. There are no toxic fumes and it won't irritate your skin. Quick'n Brite is safe around children, pets, food, and will do no harm if it works its way into lakes and streams. With all of these benefits, it is hard to believe that it works as well as it does, but this is the best cleaner available. It will clean stains that other cleaners can't even touch. It is the absolute best natural cleaning product ever on the market. The perfect, all-purpose, household cleaner. You will be amazed at how well it cleans and how easy it is to use. Buy Yours Today! 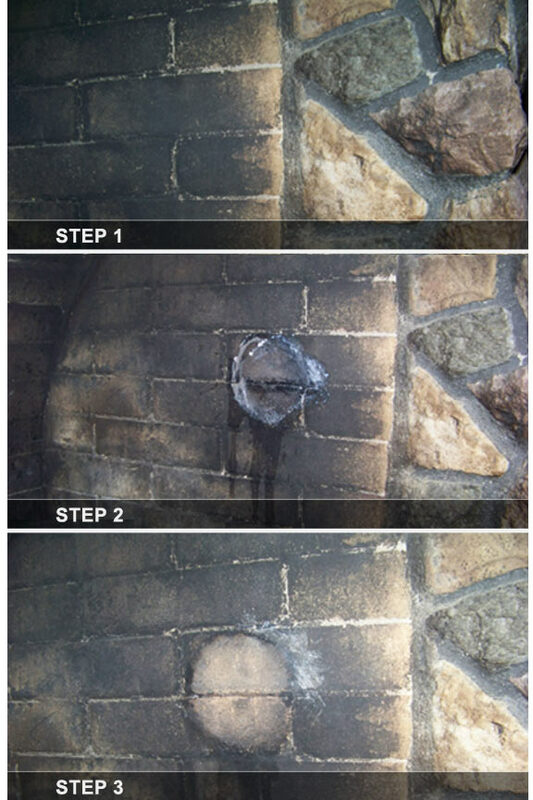 Cleans fireplace soot from brick, stone and glass. clean pools, decks, patio furniture, siding, floors, cabinets, painted surfaces and more. Paste Container Sizes 30 oz. Liquid Container Sizes 64 oz. & 32 oz. Quick'n Brite Deluxe Kit - Clean anything you can get wet with water! Quick'n Brite is a highly concentrated, environmentally safe (phosphate-free) organic solvent for all your cleaning needs. Whether cleaning floors, autos, windows, or even your pet, it is perfect for any job! Just received my order yesterday. I've used this product for years and am always pleased and amazed how well it works. Especially on hard to remove or old stains in clothes or on furniture. I havent tried the greasy garage floor, hmmm I'm going to try that sometime. Right now I'm working on a grease stain soaked into my marvel table... so far I rate it a 5 star plus. It may take a few tries, pretreating but it doesn't fail. Thanks for the follow up. Have not used the product yet. Plan on several projects after the holidays. I have tried every trick under the sun but the soap and hard water defeats me. I tried all the products according to directions. It did good on glass door still some scum feel and ok on tile still hard water stains. But it has done better than most. I love using it in my customers houses and even my own! I get great reviews from them on how their house looks sooooo clean.I take All the credit but I know I'm using a Great product to help me achieve Great Results.If I could I would give it 100 stars. I was extremely pleased with the product. I cleaned a fireplace that has not been cleaned for approximately 45 years. You can imagine the soot and dirt that it contained. In only two washings the stone became unbelievably clean. It looks as good as new. I will certainly tell all my friends and relatives about this product. I would recommend that everyone give it a try. 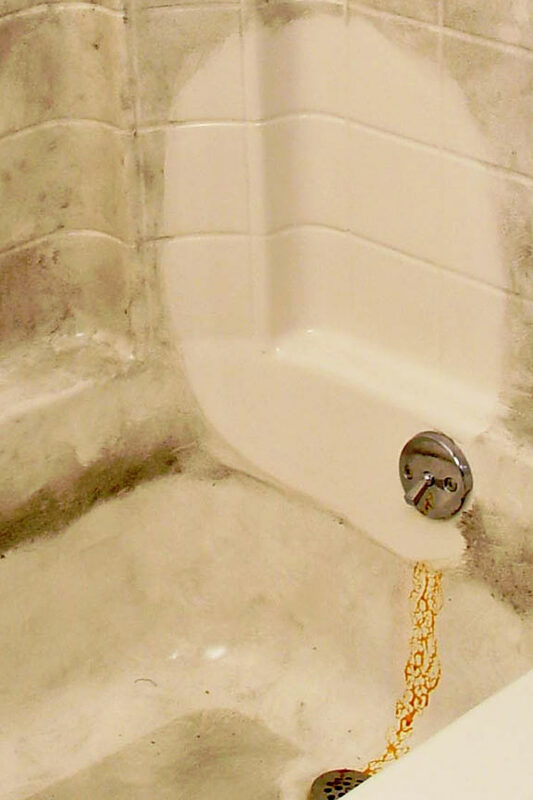 I have an older shower, probably installed more than 30 years ago. It has had rather good care over the years, even though hard water has been really harsh on it. A few years back, at a home fair, my friend & I passed the Quick n Brite booth and she said it really works and is easy. I bought it. After doing an easy thorough cleaning of wipe on, wait for it to work and then gentle rub off, I noticed the shine returning. I now use the diluted spray mixture before I turn on the shower. It doesn't take much. The shower is shiny and only occasionally needs a thorough cleaning. At the end of each shower I do squeegee it and/or towel dry it. Quick n Brite works! Have been on vacation and haven't tried the new items yet, but know they'll do a great job. 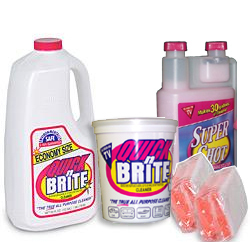 If you haven't tried Quick n Brite you must do so today. We use it to clean the white interior of our boat and the pink seats of our Diddy's golf cart at work and they both look amazing. After cleaning first with another product we just thought the white was white. When we used Quick n Brite it became noticably brighter and totally cleaner. It is amazing. Quick n Brite work real well for all kind task. I use it to clean my truck, and much to my surprise it did real good. The same with the windows and doors. You have sold me! I love Quick n Brite. I purchased this product at a fair years ago and have used it ever since. Recently, we used it to clean the deck and it was fabulous! Quick n Brite worked better and faster than anything we've used in the past. This product never ceases to amaze me as I continue to find new ways to use it! Thank you! You know not many things work as advertised but I was pleasantly surprised by this product . Considering buying more before they find out how good this works and takes it off the market. I'm sure this will get deleted. I don't want a phone call or an e-mail reply. I'm just sorry I wasted my money on crap that doesn't do a damn thing. I did exactly like the instructions said... THREE TIMES. Nothing!!! I will not be buying any of this again or falling for anymore BS sold at fairs. Lime Away ya'll! That's what works and it was only a dollar at Dollar Tree! Wear gloves sadly! simplygoodstuff response: LOL. How could we delete the ONLY one star review in the past six years? If you've changed your mind about wanting help, we would be happy to assist. Just give us a call. You do not need toxic chemicals to do the job, and gloves should be for cold weather, not cleaning. Great product! Cuts thru kitchen grease really well. Have been using to clean many items in my house. I am very impressed with the product. You really can clean anything with it. I have a cleaning service and my customers have been completely satisfied with the products. I went to clean a mirror when I realized that you could use the product on anything. So, I used it and was amazed at how clean it got them. This is the third time I have ordered Quick'n Brite and I will always have it available. The stuff works. i have used Quick'n Brite for close to 20 years for every cleaning job i have. it works great and there is no nasty chemical smell, just a fresh clean smell. it works especially well on windows. no streaking and it's a snap. I ordered the Quick'n Brite deluxe package to clean out thick black fireplace soot. This product worked as directed. It cleans deep with very little effort. I will continue to use around the house as needed. I love this stuff, It works really well on the Bathrooms. I've been using it for years and you only need a little so it last a very long time. Quick & Brite was no better than other cleaners for the oven and shower, but was exceptional for cleaning glass. It is the first time my wife has done a mirror without leaving streaks. I got this a long time ago from a home show where I used to live. It amazed me how well it works. I have used it on my floors, great for cleaning my oil painting brushes. The paste lasted me a really long time. I have used QuickNBrite for years. It is the best cleaning product you can buy.No harsh chemicals & the fresh clean smell is a big plus. I can honestly say this stuff really works. I had a greasy/dirty spot on a wall and used this along with 3 other cleaners. They all eventually did the job but the quick-n-brite did it faster & with the best results. It also got out set in stain from a carpet. My favorite use is for my bigscreen TV. I use an extra light solution with a touch of isporyl alcohol & it is the ONLY thing that keeps it clean and streak free. I truly believe in this product and use it all around the house and vehicles. this stuff is great good for every thing. stains I could not get out of stainless steel. cleans Pool tile. I love it! How well does this work on Fiberglass showers and what is the application? It works great on fiberglass. For the first application, you'll want to use the paste full strength. After that, you can maintain the clean surface with a diluted mixture in a spray bottle. which product will clean soot off ceramic logs & wall water-painted wall? For the logs, you will want to use the paste full strength. Put it on there with the included scrub sponge(damp), and then let it sit for 10-20 minutes. Wipe clean with a dry terry cloth towel. On walls, it will be easier to work with a diluted solution in a spray bottle. You can melt paste and then add to water, or you can pour the liquid right in. Once spray-able, a light spritzing and then a wipe with a good microfiber cloth should do the trick. For further assistance, feel free to give us a call. What product is best to clean white leather office chairs? Some of them have black smudges and are looking a little dirty. Thanks! Yes. We do ship to Canada. Shipping cost will vary based on exact location and chosen method, so add it to the cart and input your location for an exact quote. Yes. It should work for that. Just make sure to use the paste because too much moisture can cause problems with leather. willl it clean dog urine stains from carpet? Yes it will. You can easily remove the stain and the smell by using this product.